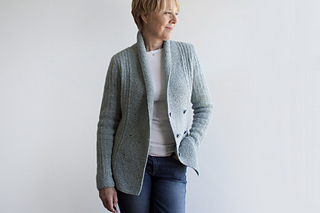 Inspired by my favorite color and a newly found Cat Stevens lyric, is Listening to the Robin’s Song – a double breasted, shaped, worsted weight cardigan of simple knits and purls. 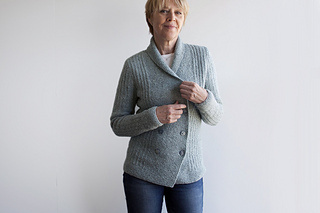 The 2-row repeat of this Garter Rib stitch pattern creates an overall texture of slimming verticals, that border a central Garter stitch panel extending up and around the neckline as a cozy collar. 6 buttons snug it at its middle, or wear it open and casual – as you wish. Seaming is minimal in this piece, worked top down, with circular sleeves set in. A steam at the end gets the job done, requiring no blocking if that’s your preference. 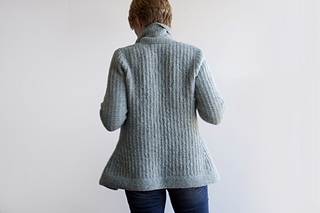 You’ll find the at-the-same-time instructions of its shaping, buttonholes, and gauge-equalizing short rows, to be super easy to manage by following the tracking grids I’ve included, mapping it all row by row. Enjoy! Shown in size 36½“/92.7 cm, worn with approx 1”/2.5 cm ease. 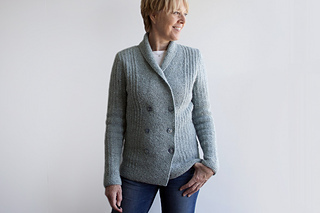 Shown in Owl by Quince & Co. (50% American Wool, 50% American Alpaca; 120 yds per 50g skein); color – Cielo #318; 10, 11, 12, 13, 14, 16, 17 skeins, or for comparable yarn, approx 1170, 1300, 1410, 1550, 1680, 1835, 1975 yards / 1070, 1190, 1290, 1420, 1540, 1680, 1805 m.
Long-tail CO, Knitted CO, Provisional CO, decreases (ssk, k2tog), increases (m1R, m1L, yo), short row shaping, circular knitting (sleeves), and setting in sleeve caps. 14 page PDF includes pattern instructions, photographs, schematics, stitch description, row tracking grids for managing short row intervals, helpful links to online tutorials, and definitions for relevant abbreviations.